What a month for Java 7. 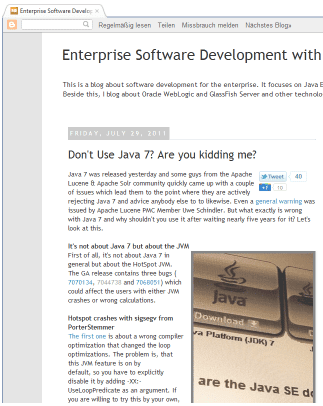 Articles about the new features all over and just at the release day, Apache issued a warning, not to use Java. That's a big meal for the press and German based S&S Media caught up on that quickly (Java 7 Causes Headaches for Lucene and Solr Users). And even my 2c have been published (German). Nearly one month after the initial report, everything is back to normal. Mostly because of the fact, that the mentioned bugs ( 7070134, 7044738 and 7068051) are fixed with the latest jdk7u2-b04 (Changes, Download). And further on, there is another build b05 available since 31-Aug-2011 (Changes, Download). 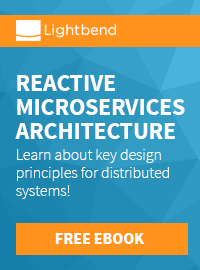 What can you do to prevent future bugs? Test. Test. Test. As with any software or product. And let Oracle know about "bugs that bug you". Help testing early access builds, follow the JDK7 project and report issues you find to the bug tracker. 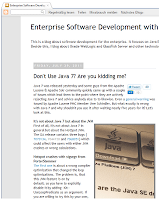 Use Java 7 to make it better! I am not kidding!